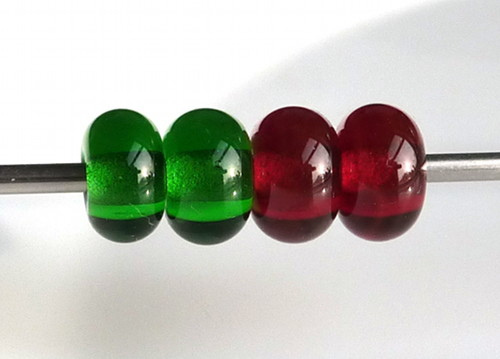 CiM oz is an emerald green and cranberry pink is a deep reddish gold pink, CiM’s version of rubino. I don’t have a lot to say about oz – it’s emerald! A very nice emerald too. I have plans to do a nice big side-by-side of all my greens, but that requires a bit more organisation. Here it encases a core of CiM soylent, with white scrollwork on top and emerald over white dots. I decided to do a head-to-head test of cranberry pink vs rubino, and I threw in Reichenbach gold violet as well, because I had a rod handy. As you can see, gold violet is indeed more violet. 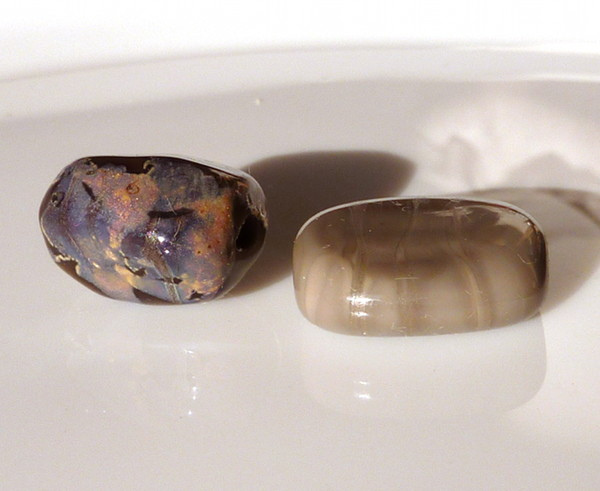 Reichenbach also has pink lady, which is less dense, and gold ruby light which is lighter and peachier. The white in these beads is Effetre. 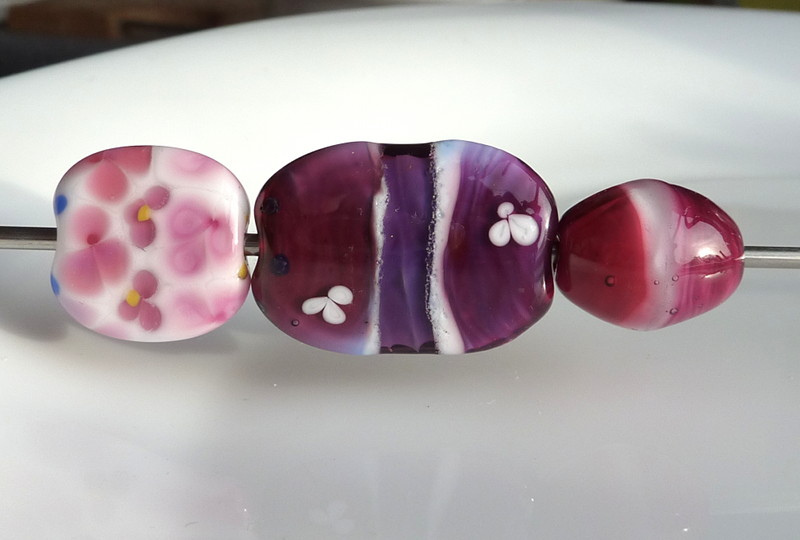 The left bead has tri-petal flowers, cranberry pink on the left, gold violet in the centre and rubino on the right. The cranberry is darker than the rubino in small dots. 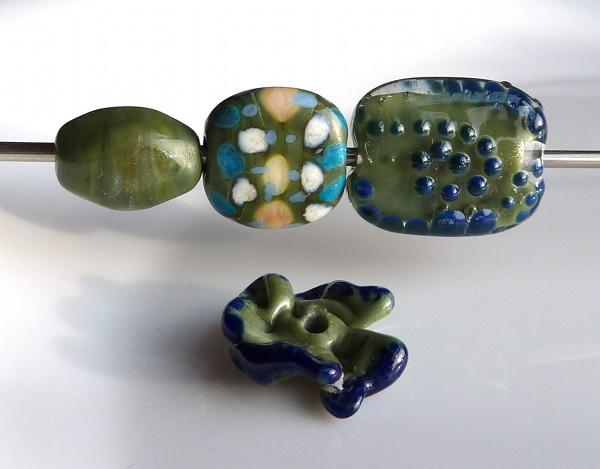 The centre bead has the colours in the same order, over a periwinkle core, with white dividing stripes and little flowers. Rubino over periwinkle is a classic combination to get purple – I prefer the shade you get from it to the one you get from the cranberry pink. The gold violet gets something much bluer. 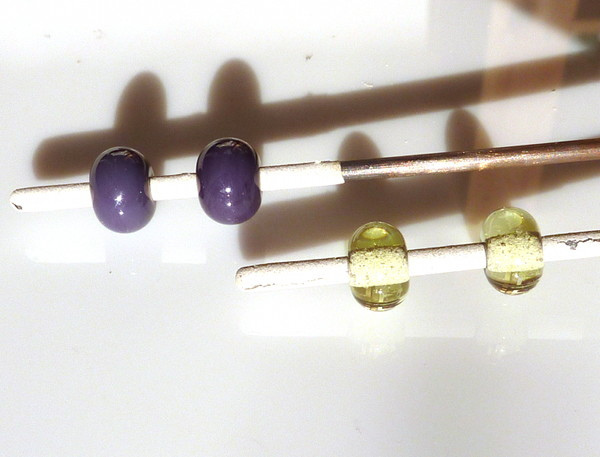 In the right bead I left out the gold violet. White core, cranberry pink on the left and rubino on the right, with 006 clear in the centre. It wasn’t obvious until I took it off the mandrel after annealing, but the cranberry pink has cracked in three places, going along the mandrel until it hits the white, then the crack sharply changes direction and stops. This has me suspicious that it may not be thermal, especially as I have read other threads of people having problems encasing both Effetre and CiM whites with cranberry. 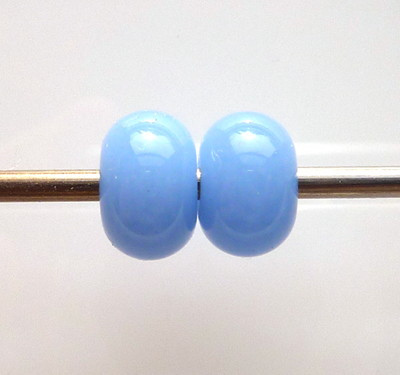 I can’t entirely rule out thermal shock since I spent a while shaping the ends of the bead, but I haven’t seen a thermal crack that changes then stops like that. Needs more investigation. 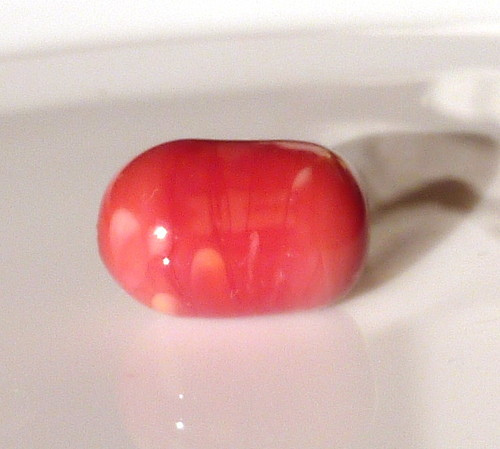 This is a bead with cranberry pink and oz over dirty martini. Dirty martini is a very handy pale dull minty green that makes a good background for all kinds of things, including reactive colours and frits. 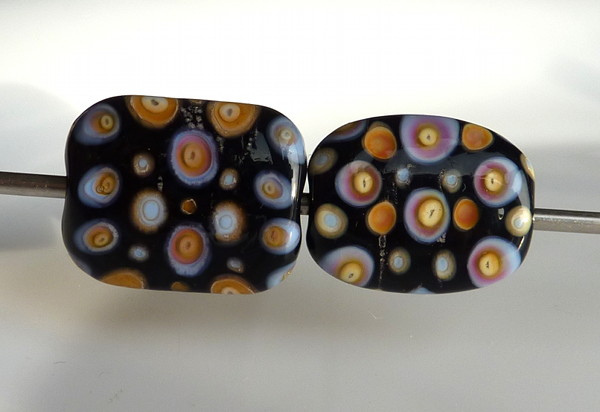 Very final test: this is the classic colour reaction of rubino, opal yellow and periwinkle, over a black base. I decided to duplicate Jolene’s test which replaces rubino with cranberry pink and tests opal yellow against CiM stoneground. The base in both cases is CiM tuxedo. The scum on the beads is either because I boiled the surface a tad, or I had some traces of silver leaf left on my marver – that’s totally my fault. 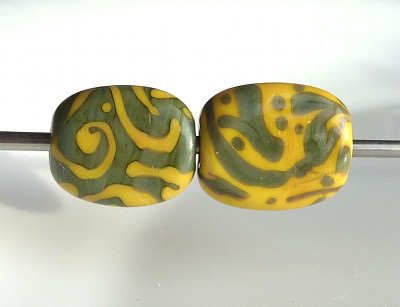 The right bead is the original combination. Things to note: stoneground strikes more easily than opal yellow so is darker and less contrasting in this application. 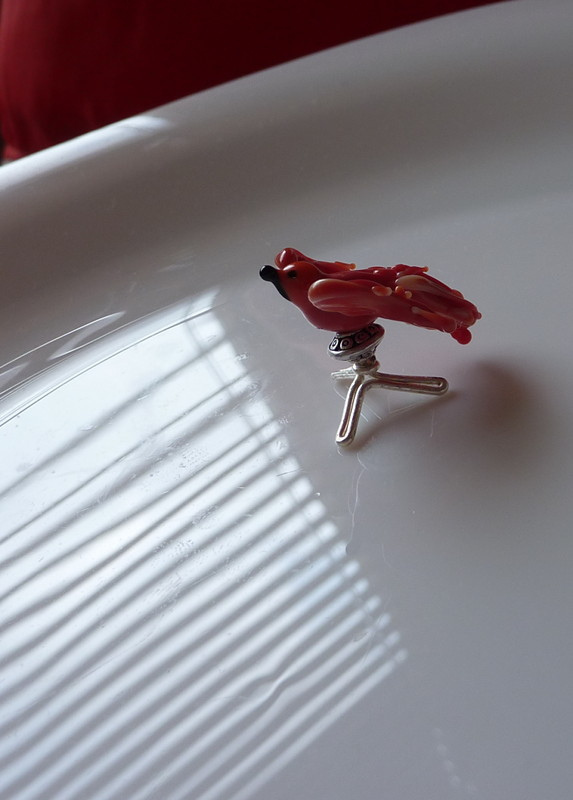 The cranberry is redder. In this case I prefer the originals, but I think taking care not to strike the stoneground too much would make them more similar. (Most of the time, stoneground’s easier striking is a very good thing). I didn’t replace the periwinkle because it’s cheap and available. The one I am using is Vetrofond. Conclusion: cranberry pink is a deeper, redder colour than the batch of rubino I have, but is also rather more expensive. 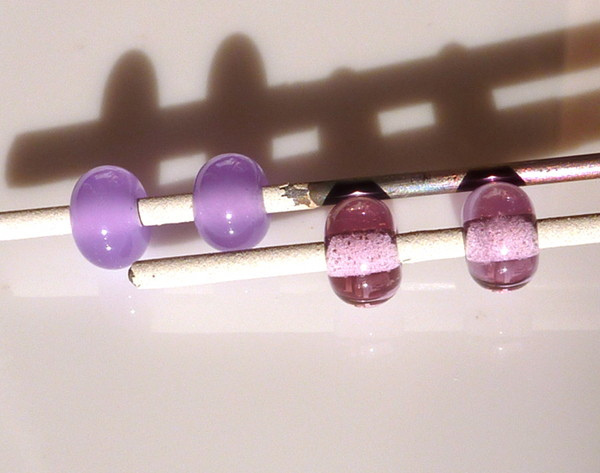 I prefer the colour of rubino for a deep pink, and also in the classic colour reaction bead. I am a bit worried by the cracking over white I got. I’ll try it again to see if it repeats. It is a beautiful colour in spacers, though. Gold violet’s different enough from both to keep in my palette. CiM commando is similar to olive, but is a bluer green where olive is yellower. 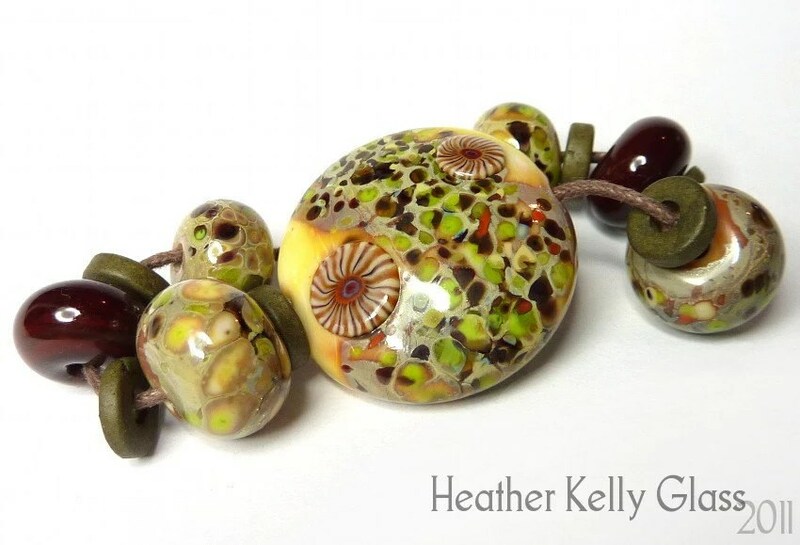 I did a few test beads – nothing very spectacular happened. 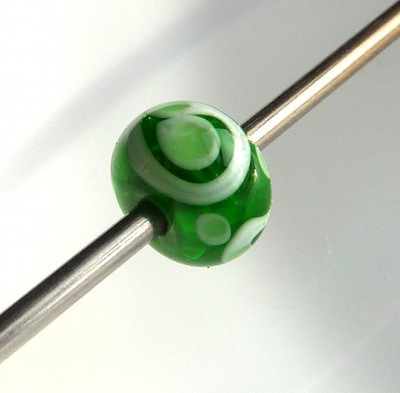 The first bead has silver foil on the surface. I think I reduced it – nothing’s happened. 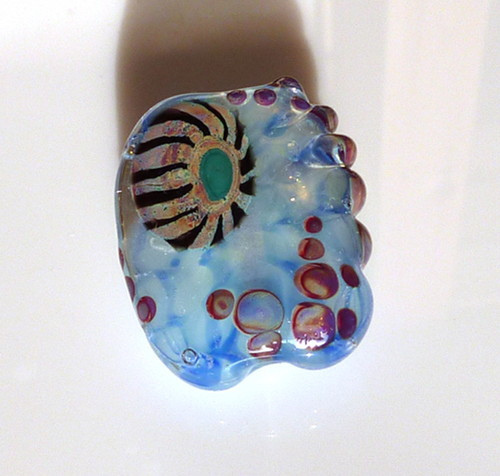 The second bead was to test colour reactions. There’s a slight outline with the dark ivory and a very very slight separation round the dark turquoise. The opal yellow has sunk in and the periwinkle seems to float. The third has silver foil, is encased in clear and has Reichenbach iris blue dots on top. 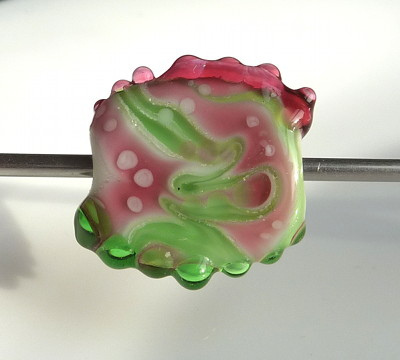 The bottom bead is a flower attempt where the bead release broke so the centre’s slightly pointy. It has silver blue frit on the edges. I tried with Effetre pastel yellow. Left is commando base with pastel yellow scrolls – slight outline on the scrollwork. The right is the reverse but I didn’t have stringer ready so it’s drawn with the rod, hence the thicker lines. Reaction line not very visible around the green. Conclusion: really not very reactive. I think I prefer olive, but if you like the bluer tone, go for this one. CiM African gray is a limited edition colour. 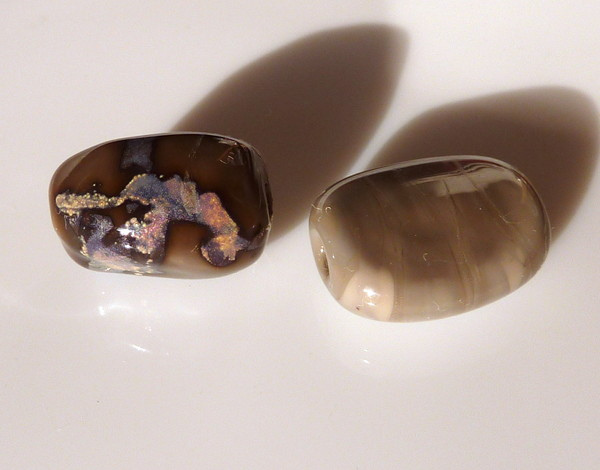 The rods have a shampoo-like sheen and unlike most of CiM’s colours, they actually retain this effect after being melted. I only have one rod of this colour for testing, but I would love to have more. If our vendors get any over here I’ll grab some while it’s available. I do have some CiM hippo, another limited edition grey – it is a bit browner and doesn’t have the sheen. 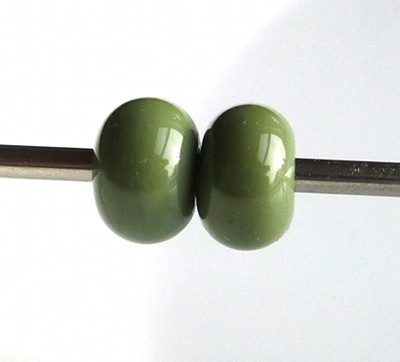 I made one plain pressed bead – you can see that the colour darkens slightly as you work it. I was specifically trying to keep the streakiness here. The nugget has silver foil on the surface and was reduced. 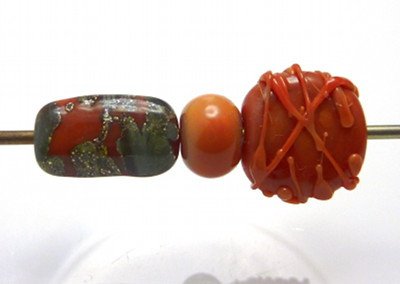 The foil has fumed the surface darker, developed some interesting colours, and the grey’s sheen makes the foil seem to almost float on the surface of the bead. 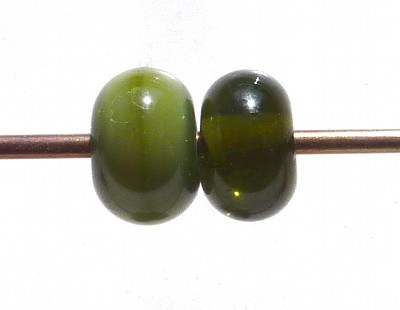 Same two beads, another side. You can see the fumed colour better. CiM lapis is a dark opaque blue-purple and mojito is a transparent yellow-green. They’re both lovely and well-behaved colours and I added them both to my colour collection pretty quickly. I made some test beads here. 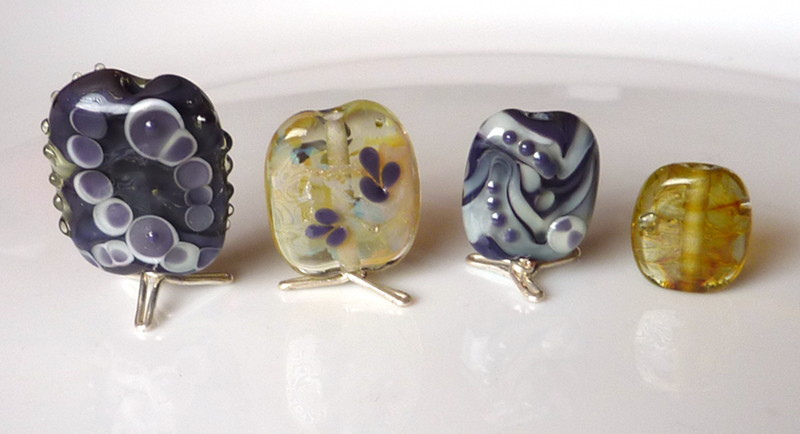 The first one has a lapis core covered in silver leaf. It was then encased in mojito and has lapis on white dots and mojito raised dots. The second is mojito with silver leaf, reduced and encased in more mojito. It has lapis petals and the foil’s gone a hard-to-photograph mother of pearl. 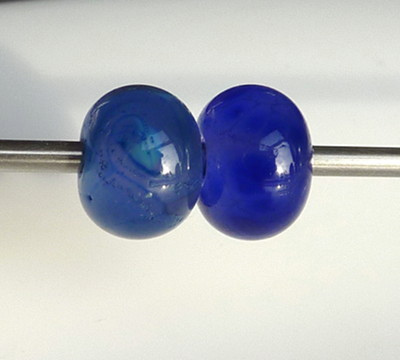 The third bead is lapis with raked white and mojito on top of the white, and further small lapis dots. The fourth is just mojito with encased silver leaf.